Twino is a Latvian peer to peer lender specialising in unsecured consumer loans. 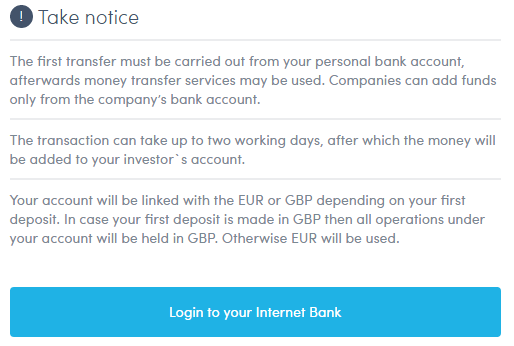 Of the continental European platforms, Twino is unique in that it also offers investments hedged in British Pounds to reduce currency risk for UK lenders. The company was originally know as Finabay, and operated in this form since 2009. They launched the P2P platform as we see it today in 2015. Of the €332 million they’ve lent as an organisation since 2009, about €115 million was as Twino. Note: I am not an investor in Twino, these are just my ‘working notes’ to decide if I invest. Sell Out: Yes, a secondary market. However, once a loan has defaulted you cannot sell it. Based on some of the conversations I had with Twino when doing research for the first taxation post above, they seemed to be reasonably well prepared for UK investors. To start, they allow the download of tax reports across any specified dates: useful as the UK personal tax year is quite unique. They also have information to allow you to work out the borrower country, using the loan book data. This is useful as HMRC wants you to break out foreign loan income on a country-by-country basis. Note that although the British Pound account sounds great to reduce currency risk, it may not be that easy for money transfers. Counterintuitively, you could see problems doing transfers from a low-fee money exchange service like Transferwise from GBP->GBP. TWINO provides a BuyBack Guarantee on most of the loans that are listed on the platform: under the BuyBack Guarantee investor protection scheme, TWINO will compensate the investors both the invested principal amount and interest, as well as pay the accrued interest in case a borrower is late with the repayment for over 30 days. There is an auto-investor that allows you to spread investments according to your preferences, for example 12%+ with BuyBack guarantee. Since December 2016, Twino have been offering lenders the opportunity to invest in Russian loans. These are at a huge interest to the borrowers, over 100%, but after defaults and Twino’s fees it’s expected lenders will earn around 14%. Jevgenijs Kazanins, the CEO of Twino, told CrowdfundInsider that he felt after the sanctions placed on Russia from the Crimea annexation there was an opportunity for Twino to step in. How does that play with your conscience: colossal interest rates to consumer borrowers and going against the spirit of international sanctions? Or do you see Twino as a kind force stepping in to provide a lost function for the unfairly penalised Russian consumer? Fortunately, you can choose which countries to lend to yourself depending on your view. My bank, Natwest, charges a minimum of £23 to do a money transfer. Most platforms offer you an incentive to try them out, rather than impose a barrier to entry! I tried the trick of logging out and logging back in again that sometimes skips these checks, but it didn’t work. Also notable during registration was a box for a ‘Twino Promo Code’, which made me think something was available, but I couldn’t find any details about this online. Twino has potential, but I was not convinced enough to invest. I would have liked to had a look around the platform to get a feel for the interface, but was not prepared to pay £23 in banking fees for the privilege! There is a scope for diversification here, and the possibility of 12%+ loans, protected with BuyBack and hedged to the pound is quite appealing. Remember to factor in exchange rate fees and charges from your UK bank account or 3rd party exchange provider before deciding to invest. You are an active investor in Twino or have been in the last 6 months.